Quickly cooked spiced chicken served with cool lettuce cups make for the perfect appetizer or even a light meal. If you can find mung bean noodles you will want to fry those up and serve them with these. 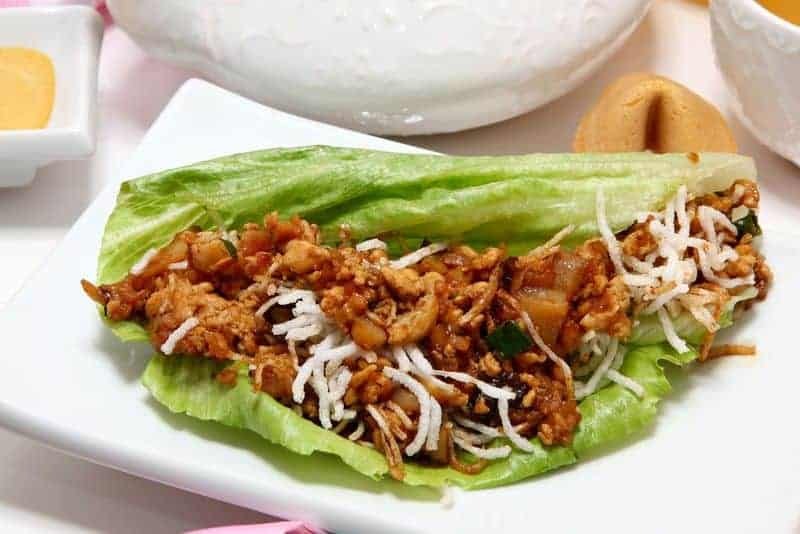 You can recreate PF Changs Chicken Lettuce wraps with this copycat recipe. Mix all ingredients for "cooking sauce" and set aside. In a medium bowl, combine marinade ingredients and mix well. Add chicken and stir to coat thoroughly. Stir in 1 teaspoon oil and let sit for 15 minutes. Heat wok or large skillet over medium-high heat. Add 3 tablespoons oil, then add chicken and stir-fry for about 3-4 minutes. Set aside. Add 2 tablespoons oil to the pan. Add ginger, garlic, and onion and stir-fry for a minute or so. Add mushrooms, bamboo shoots and water chestnuts stir-fry an additional 2 minutes. Return chicken to the pan. Add mixed cooking sauce to the pan. Cook until thickened and hot. Break cooked cellophane noodles into small pieces and cover bottom of serving the dish with them. Then pour chicken mixture on top of noodles. Serve alongside lettuce leaves, allowing everyone to take what they want, and then spoon into lettuce leaf and roll (like a burrito) individually. Thanks to MarcyG76 for sharing this recipe. Yummm I can’t wait to try this ???? I see that you have a Houston’s soup receipe, is there anyway for you to copykat their tortilla soup receipe? It is the best out there, as well as their chicken tenders – I hear that Houstons is notorious for keeping thier receipes a secret – but as a good cook, we can uncover the secrets!! I am working on this one! This is a nice recipe. I have made this several times for the family and for other events. I now do a double mix (separately) for chicken and beef using all the same ingredients. For the noodles, I don’t get picky down to using Ramen with (2) packs cooked and (1) crushed to add a little crunch to the mix. Not sure about the ‘canned shiitakes’, I can only say, fresh produce is the way to go. For the chicken, simple as picking up a rotisserie cooked ready to go at your local grocery store, strip the skin, meat and dice up (And you can skip the step for cooking the meat but, I do still add the marinade, oil and let rest for awhile in the fridge while prepping the other items.). For the beef, I purchase (1) pound of thin sliced sirloin and dice up per the recipe, the marinade and cooking is the same. You can figure at least two heads of lettuce per recipe and double that if you do both chicken and beef. A tip for doing it the first time, clean up and put up as you go due to once you start cooking, it’s fast paced and you’re done. You can have your dish ready with the noodles, cook each meat per recipe, clean out the wok and do it one more time. I don’t get picky on the condiments. I serve low sodium soy sauce plain and for a little more heat, I dice up a habanero and mix with the soy sauce. Can’t add to Pinterest, can’t add to Recipe Box. This recipe was ok. Don’t use canned Shitake mushrooms. They make the recipe too mushy. If I try it again, I’ll use fresh or another type of mushrooms. how aboout the dipping sauces? Exellent recipe! I’ve made this many, many times for my family. Just an FYI, I buy my Malfun noodles already prepared at the chinese restaurant. They are cheap to buy and you don’t get oil splatter all over the kitchen! There is a resturaunt in Seattle Washinton call the Fisherman Rest. They make a to die for clam chowder. Do you have the recipe? I do not have this recipe at this time. Please check back again later!